A growing number of people are not opting for Seapoint Clinic's affordable range of veneer: Instant Veneers. Otherwise known as composite veneers, they are far cheaper than porcelain veneers and in some cases can be completed in as little as one hour, but how can this be done? Quite simply, Instant Veneers don't require any preparation of your natural teeth. This means no filling down, no major wait between appointments and no need for sedation! We often find that people can be put off by the prospect of having veneers due to the preparation that is required. Maintaining a healthy smile has never been easier with this simple, non-invasive treatment. 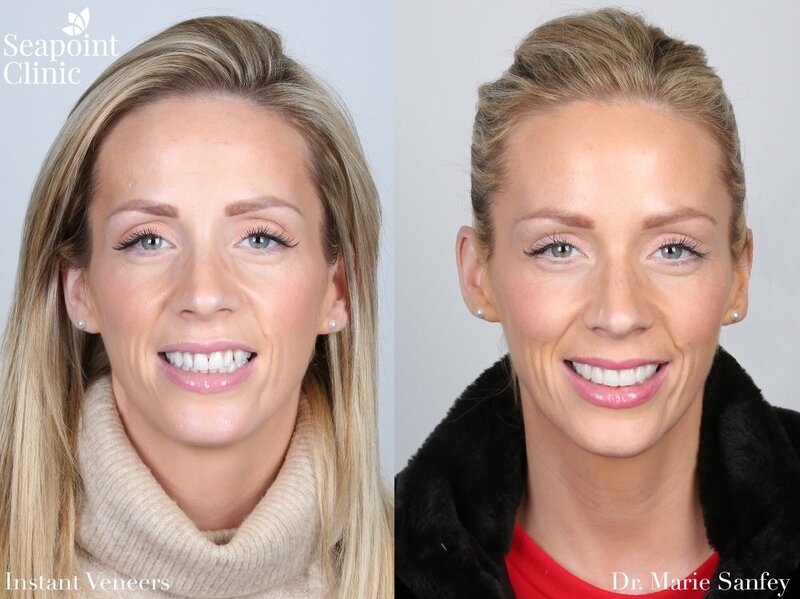 On your initial consultation, one of our experienced cosmetic dentists will discuss treatment as well as how beautiful results can be obtained in one short visit, thanks to instant veneers. Instant veneers is a great treatment because it can be done in just one visit. There's no drilling of your natural teeth, no need for numbing and it gives really lovely results. Unlike porcelain veneers, instant veneers aren't made in a dental laboratory, making them far cheaper to produce. Instead, these veneers are handcrafted while you sit in the dentists chair and are completed in a single visit. More often than not people assume they need an entire set of veneers to improve their smile, but the vast majority of patients only require 2-4 veneers to help transform their smile. Instant veneers are less expensive than traditional porcelain veneers. Porcelain veneers are made in a dental laboratory, which means there is an added expense in designing and making the final veneers. Instant or composite are preformed in the dentists chair and are completed in one, quick visit. During your consultation, your dentist will be able to discuss all the treatment options available to you and line out the exact costs. The treatment was so quick and easy. I couldn't be happier!